– How Do I Get A Larger Hole Drilled? How Do I Get A Larger Hole Drilled? I am a contradiction. It’s not that common to be a rock’n roll musician as well as huge geek, driven (ok, admittedly addicted) to using technology and ‘componentization’ to make things easier on stage and setup/tear down faster. I wanted to attach my microphone stand to my custom pedalboard using a quick release adapter to avoid using a stand base or tripod legs. This required a large hole, much larger in diameter than the drill bits I had on my workbench. I found a trip to the hardware store put exactly the right tool in my drill to make that 1-9/16” hole. When it comes to putting a larger hole in paper or card stock, getting a larger paper drill bit is not really an option and punches usually don’t go very large either. There are some paper drill manufacturers who have bits up to ½” or 9/16” in diameter, but nothing larger. The issue with a larger hole when using a paper drill bit is that they are hollow and the waste chips or chads must be able to travel up through the inside of the bit and exit out through the drill head spindle. Higher end paper drills by Challenge Machinery can do the larger diameter bits previously mentioned, but most drill stick to only 3/8” maximum diameter. hose large hole diameters are often produced in larger bindery facilities using a process called die cutting. Die cutting machines are usually much larger (and of course much more expensive) than most of the tabletop bindery equipment that CFS carries. However, we do have some single sheet solutions coming soon. 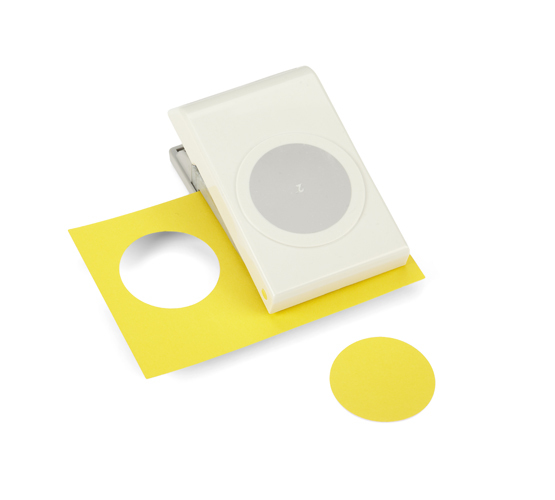 The Everywhere Punch by Fiskars allows you to punch 2″ circular windows in paper and some cardstocks. You can see it in action in the video below We hope to be adding circle punches for 1″ through 2″ diameters. Do you have a cool solution for punching larger size holes? Please share it with us in the comments below – we are always looking for new equipment to add.